In response to a comment from unbeaten heavyweight contender Tyson Fury (21-0, 15 KO’s) over the weekend where Fury said a fight between him and former WBA heavyweight champion David Haye (26-2, 24 KO’s) was “99 percent done,” Haye answered the questions on his social media site saying that he’s not agreed to fight the 6’9” heavyweight. Well, if there is going to be a fight then of course it would have to be later in the year because Haye is still nursing an injured left hand. It’s not as if the thing is going to miraculously heal overnight. He is 32 and getting up there in age. It’s kind of funny that Fury is talking as if he’s got the Haye fight in the bag. He should wait until Haye is the one chasing the fight because that seems to be the way to get Haye to agree to fight. 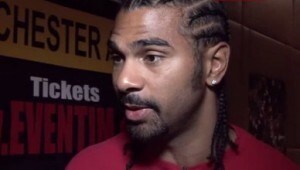 Believe me, when Haye wants to fight someone, he’s all over the media talking nonstop about that fighter. As of yet, I’m not sure if Haye really wants the Fury fight. I don’t know why he wouldn’t after seeing how truly awful Fury looked last April in beating Steve Cunningham in New York. Fury was dropped in the 2nd round of that fight by Cunningham and that wasn’t a flash knockdown. Cunningham hurt Fury with a scorching right hand to the head and Fury couldn’t take it. The Fury is probably the biggest fight in the UK for Haye right now until David Price redeems himself by beating Tony Thompson next month. I think Haye should do well against Fury and knock him out in within three rounds tops. Fury is so easy to hit and his chin is fragile as we’ve seen in his fights with Cunningham, Neven Pajkic, Nicolai Firtha and Dereck Chisora. All four of those guys had Fury hurt at one point. Previous boxing news: Q & A with super bantamweight prospect Jorge Diaz fighting June 14, in West Orange, N.J.